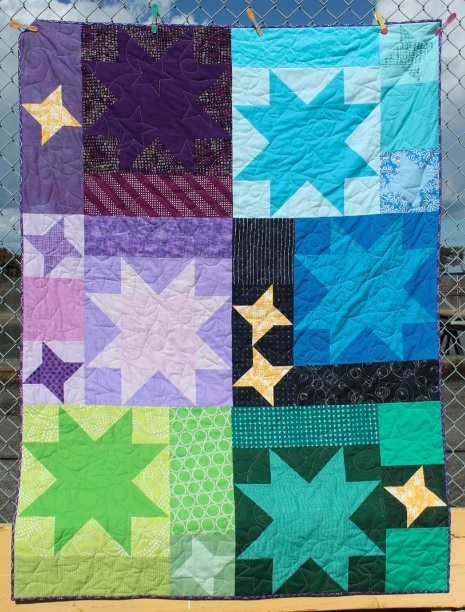 Star Light, Star Dark QAL: Winners and Parade of Quilts! 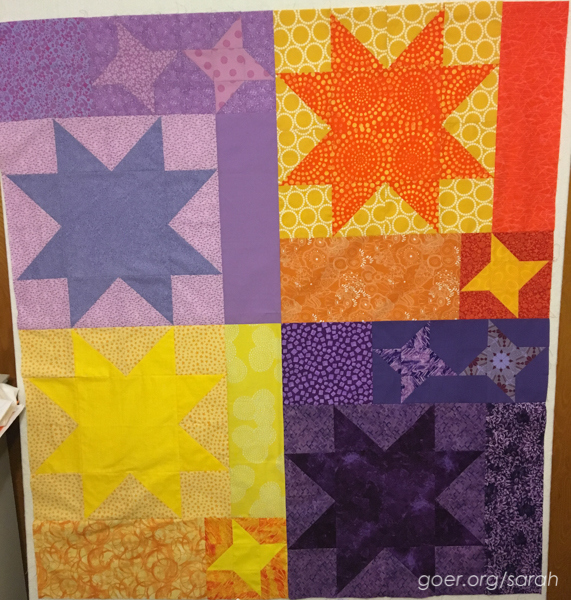 I've been leading a quilt-a-long or sew-a-long each summer for several years, and the Star Light, Star Dark QAL has been more successful than I ever could have imagined. 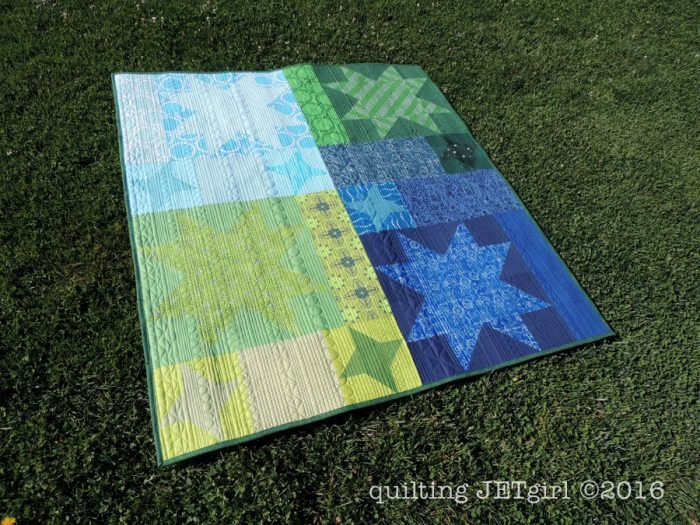 So many of you experimented with color, alternate grids, contrast, and even free motion quilting! It's been positively THRILLING to see all of your versions come to life, via link ups, our Facebook group, and Instagram. Thank you so much for sharing your process with us and for joining me on this journey! 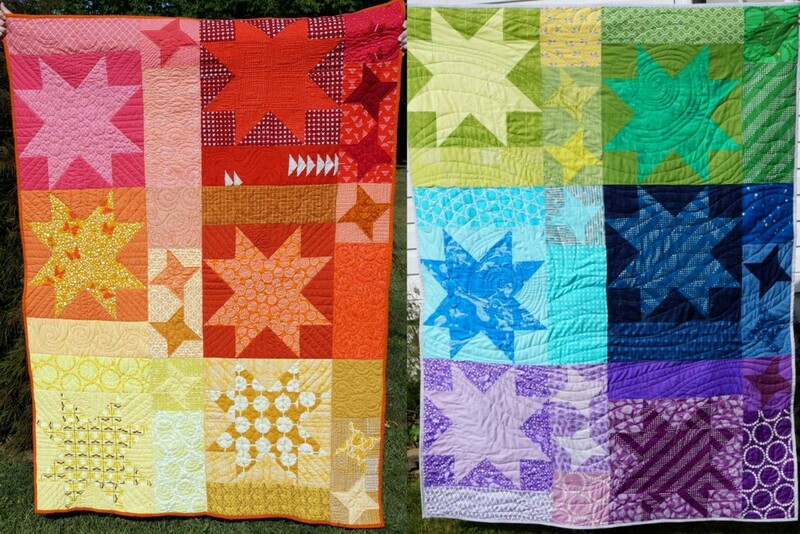 Ablaze and Illuminate, my two versions of the quilt - both are in their forever homes now! It's so fun to finally see them side by side. I just love color... can't you tell? Without further ado, here are the winners from the final link up, chosen by Random Number Generator. All winners have already been emailed. Congratulations! Please join me in congratulating the winners and thanking our generous sponsors! 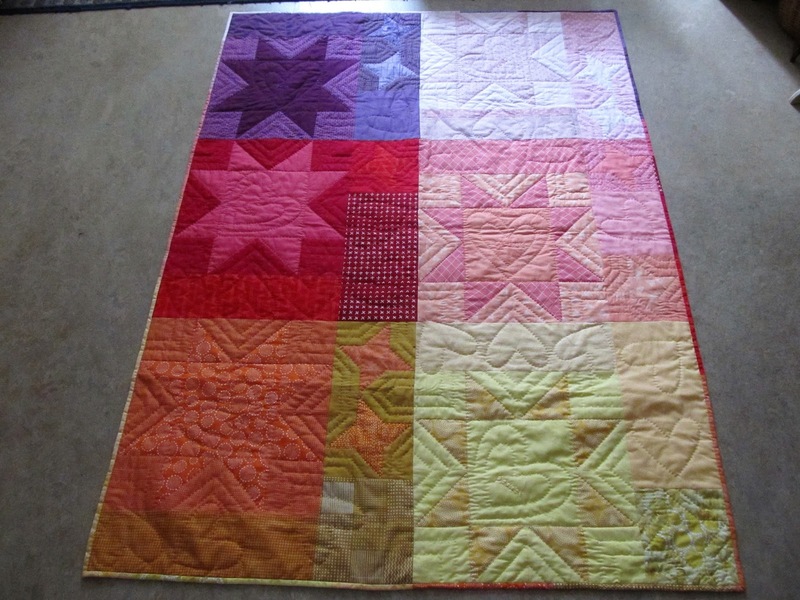 There were 25 finished tops and quilts overall, plus anyone else who is still working and/or didn't link up. 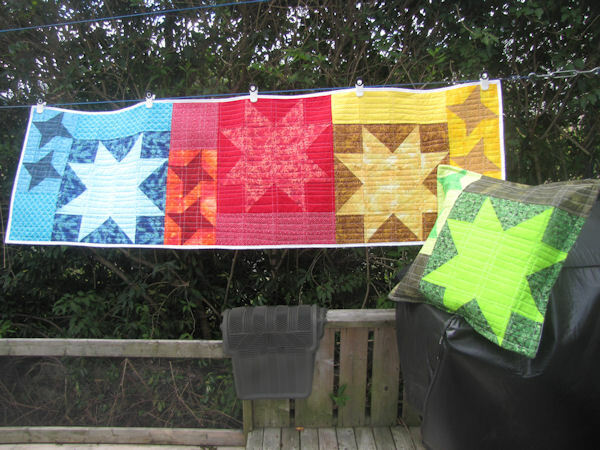 That's a lot of modern star quilts! Congratulations on your accomplishments and thank you for the stunning eye candy! 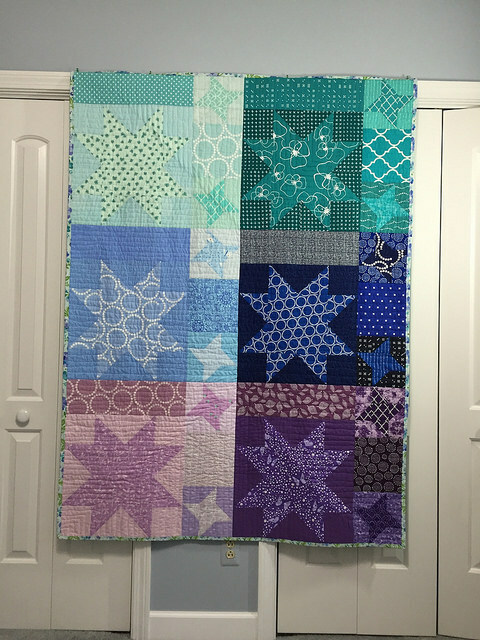 You can see all of the linked up quilts right here. 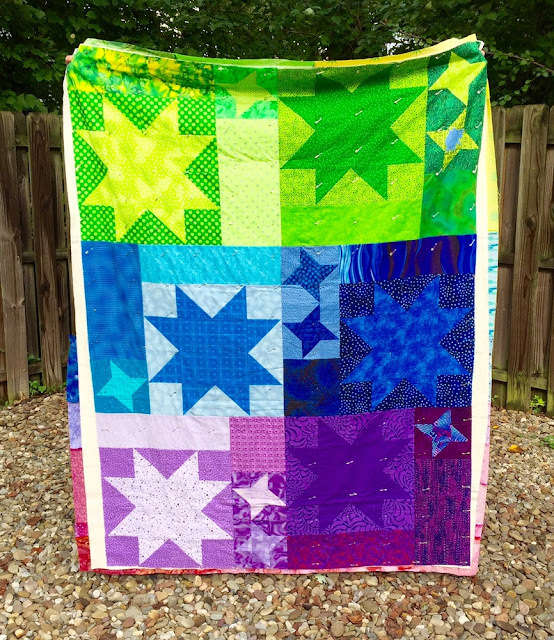 Thank you so much for quilting along with me!! It's been so much fun. I wonder - what are you looking for in a quilt-a-long? I'll take a break but I'd like to start something else up next spring or summer. I'm also coming up with some challenge ideas exclusively for the Facebook group. Thoughts? 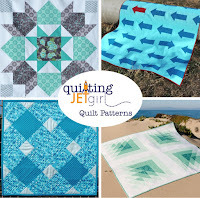 Linking up to TGIFF, Crazy Mom Quilts, and Needle and Thread Thursday in celebration of all of your quilt finishes! October 4: Winners announced << you are here! 2. 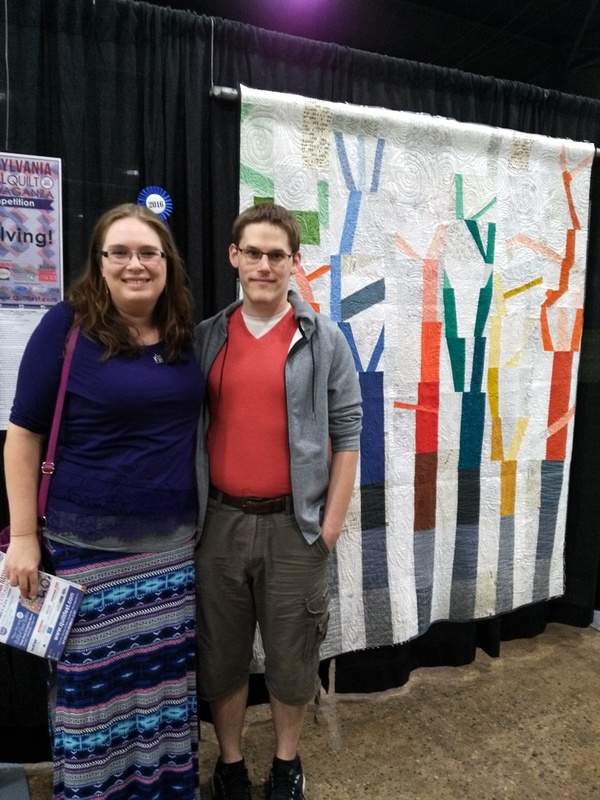 The Mr. attended his first quilt show! 3. My quilt won a ribbon! More on all of these below. 1. 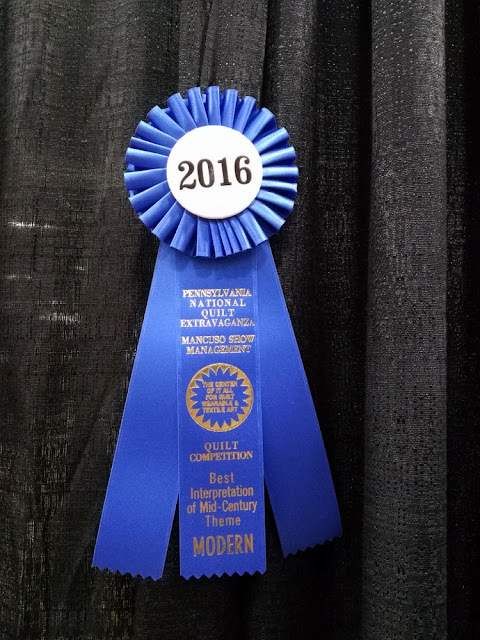 Mancuso shows traditionally exhibit traditional and art quilts - though their shows have a modern category this year! Well done, Mancuso. Modern quilting is a huge part of the quilting world now! 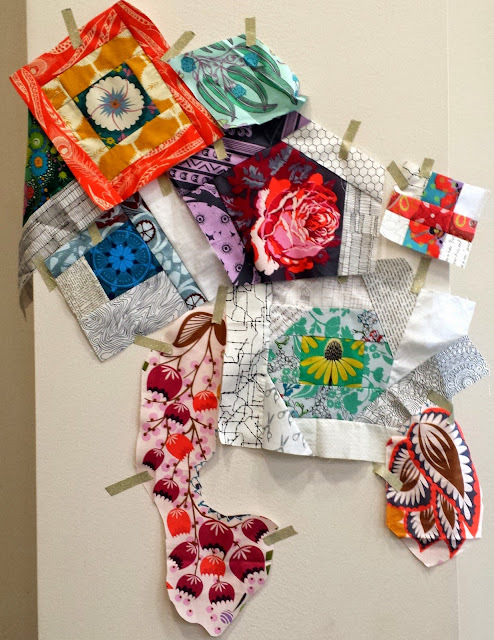 That being said, I wish there had been more entries into the modern quilt category - but I found lots of modern quilting inspiration all over (especially in the gigantic international quilts exhibit). 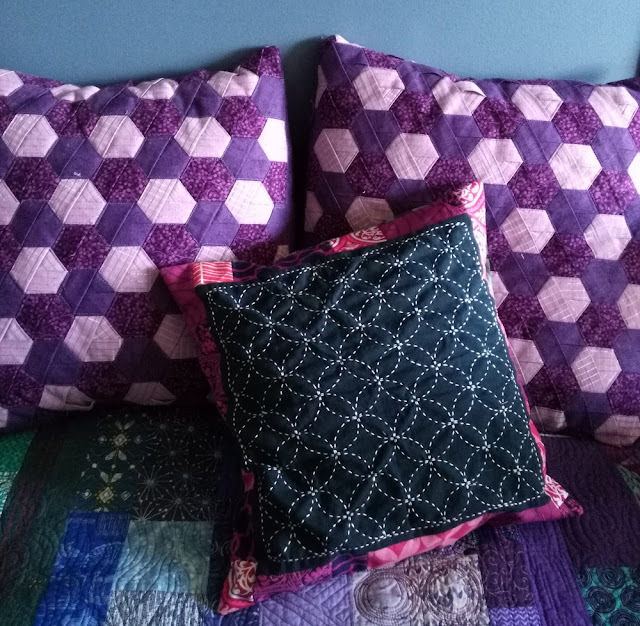 Just to be clear: I have never met a quilt I didn't like (because I love quilts), and while I can appreciate traditional quilts, I'm more of a modern traditional/modern gal. So I was pleasantly surprised by the bold colors and modern elements in the exhibit. 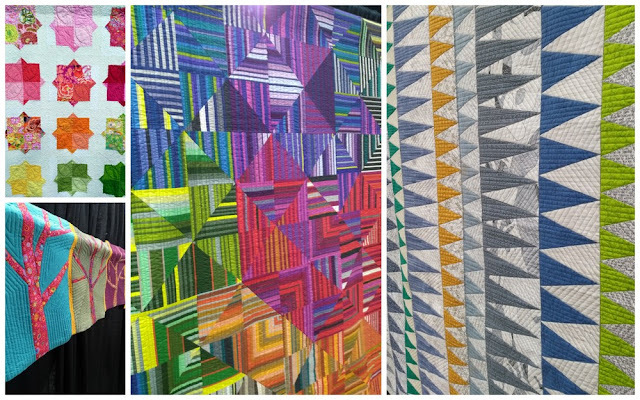 Here were some of my favorites, but it was really impossible to take pictures of them all (that's why quilt shows exist - so we can see everything in person!). 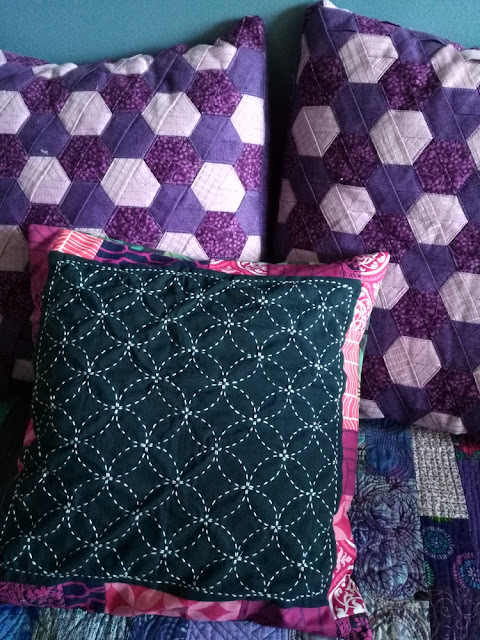 I'm particularly fond of well-done quilting (and especially that done by domestic machine) so I tended to go in for up close shots. 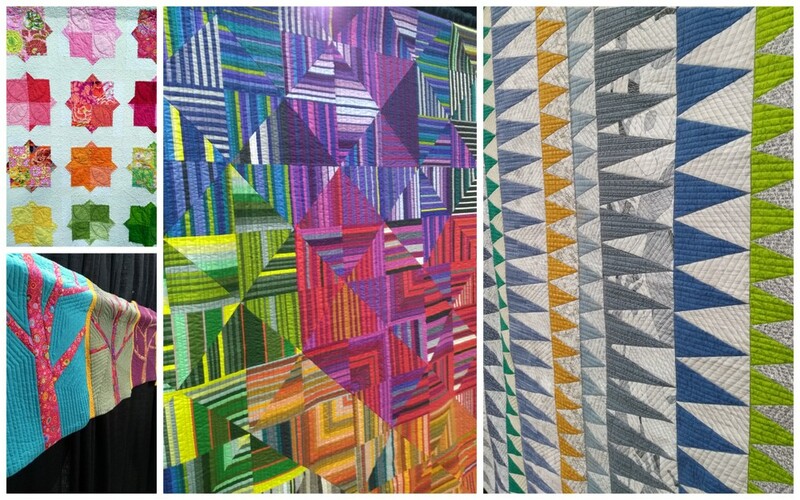 The Philly Modern Quilt Guild had a huge exhibit (below), and that was the source of much oohing and aahing from us! I posted larger versions of some of these quilts last week on my Instagram account. It was an amazing show, and I wish we had the time to see it all. 2. Though Mike and I have been together for ten years (say what, has it really been ten years?) 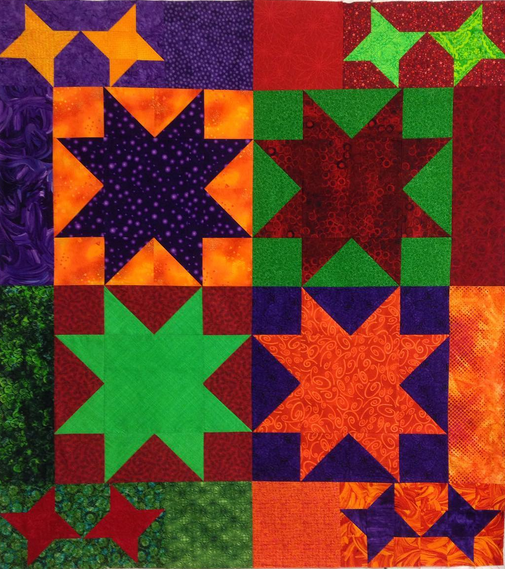 and I've been quilting for six, he's never actually been to a quilt show. 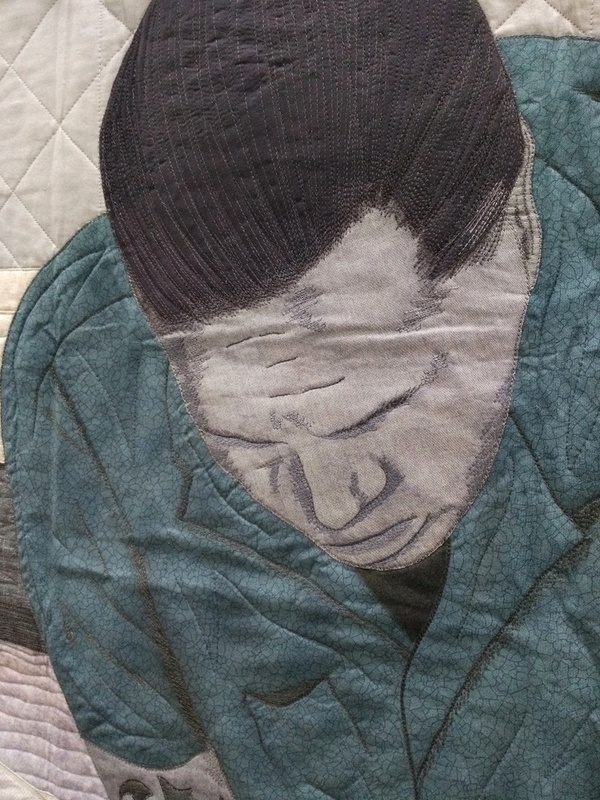 This is a real shame, since not only did I want to show off my quilt to him, but he's quite the artist himself (he draws amazingly). He's also developed quite the expertise about quilts and free motion quilting, so we walked through, making comments on stitch length (something he's jokingly particular about since I'm not so much), color combinations, panels that were quilted vs. quilts that were completely pieced, and that sort of thing. 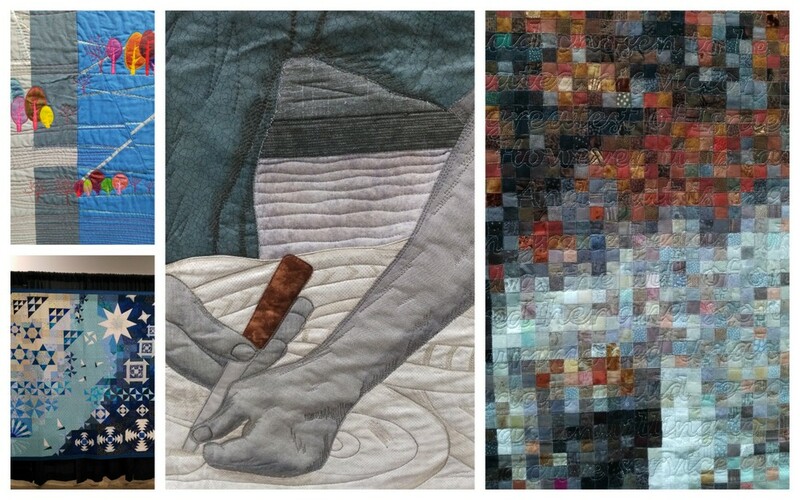 He especially ogled over "The Chisel Master" quilt (in the second mosaic featuring the hand). The detail was absolutely stunning! We also asked someone to take our picture in front of my quilt (the first pic in this post) because the quilt is about our marriage (you can read the story here). All in all, it was a successful day (and we had pizza, so, you know, all was even more excellent). 3. This was my second time entering a juried exhibit. 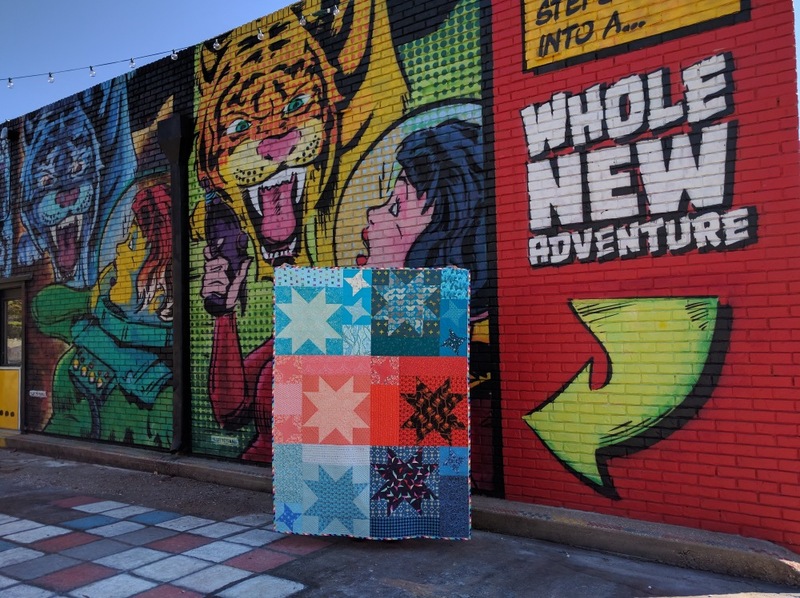 Last time was QuiltCon 2015, when this quilt was automatically accepted in after it was part of the Modern Quilt exhibit at International Quilt Festival. 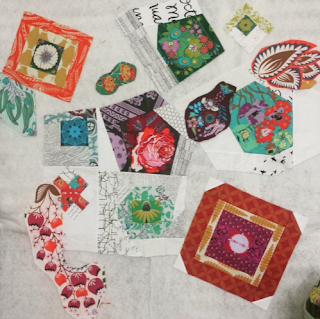 I received some great constructive feedback from QuiltCon: color balance good, work on starts and stops with quilting + stitch length. 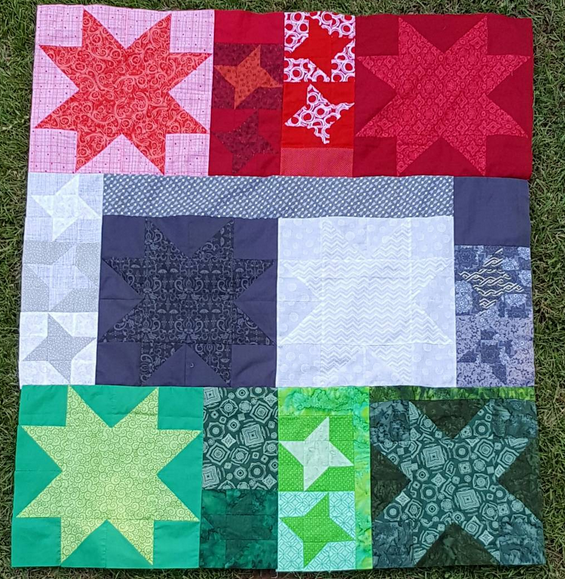 This time around, my constructive feedback was only about squaring my quilt before binding (which I still haven't found a full proof way to do - anyone have advice on that?). I found it interesting that the judges didn't make any comment on my stitch length and obvious stops/starts. It goes to show how much feedback can vary from show to show. That being said, I'm determined to enter my more recent works into shows because I've improved so much (still not striving for perfection though! 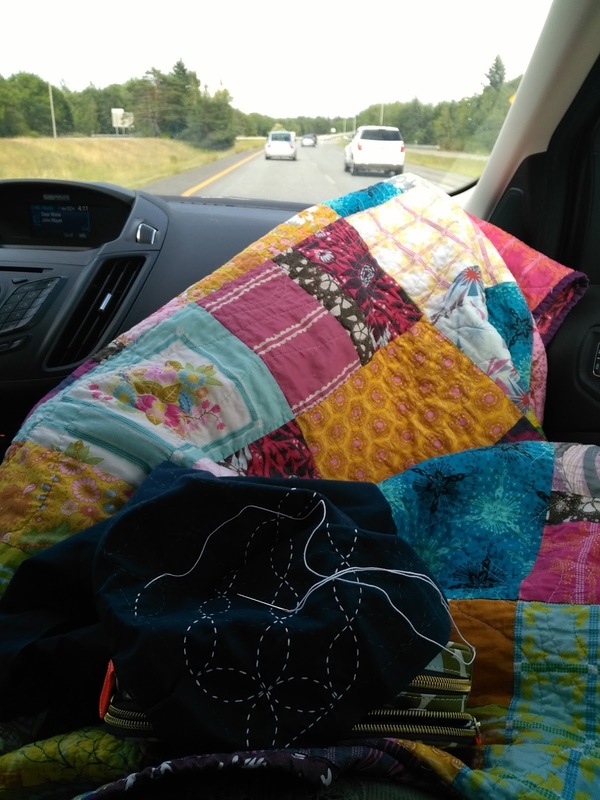 Because it's a quilt. And I'm not perfect. 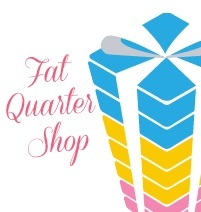 And I'm not a show quilter. :)). Otherwise, "Home" was praised for having a "mid-century modern" vibe, which is what I won the ribbon (and some prize money!) for. I originally entered it because it was my only quilt that was completely show-ready (the right label and hanging sleeve attached), and because it seemed to fit the theme of "Evolving." 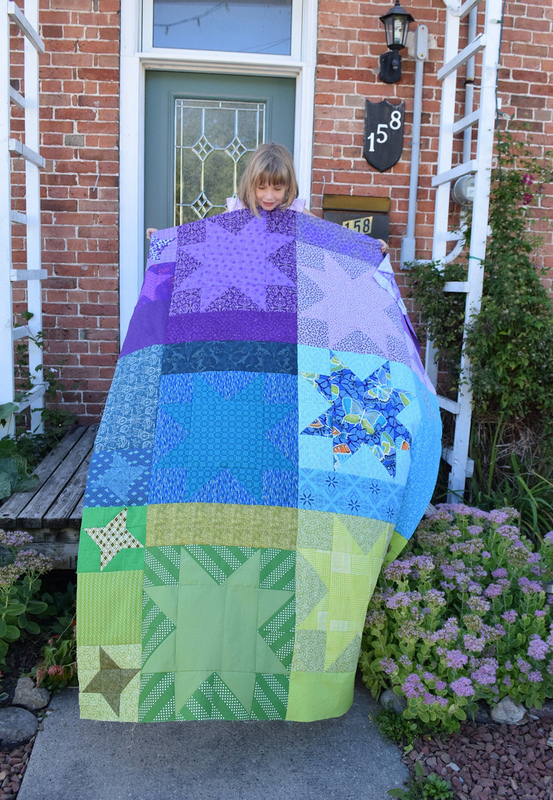 Overall, I'm thrilled with the experience and to see it hanging there with so many other gorgeous quilts was a joy. Strange light in my sewing room this morning, but this is my current mini quilt wall! 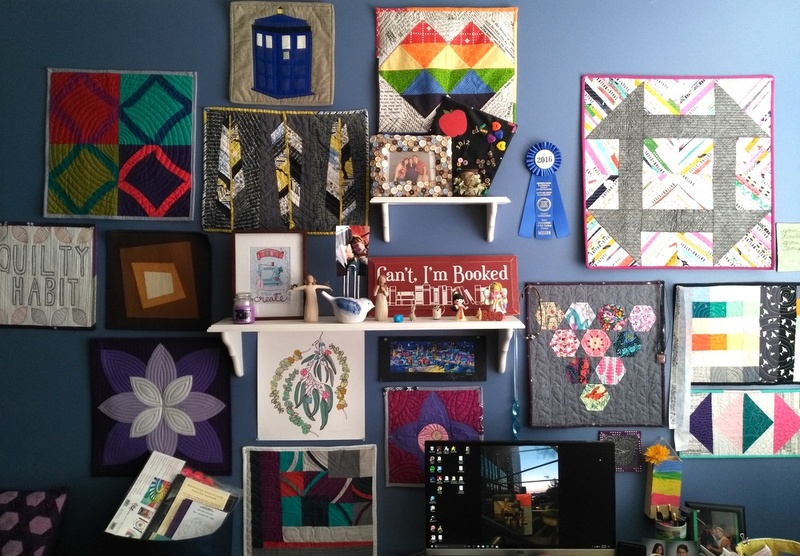 And yes, I've moved the blog logo quilt over because I need to figure out a better way to hang it on my door. 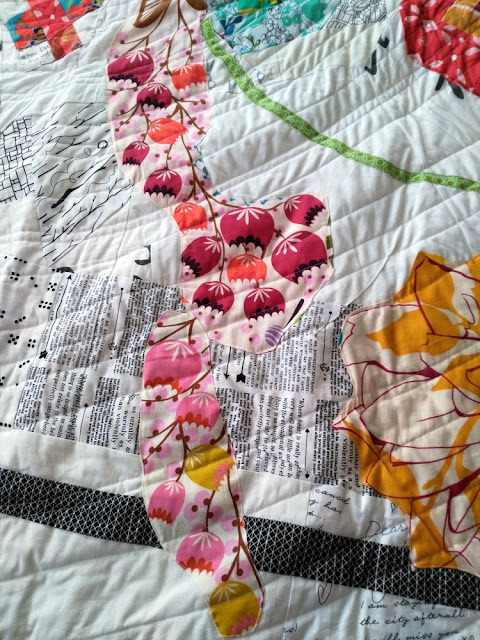 I'm not a show quilter (I'll say that again and again forever) but I will try to improve my craft. 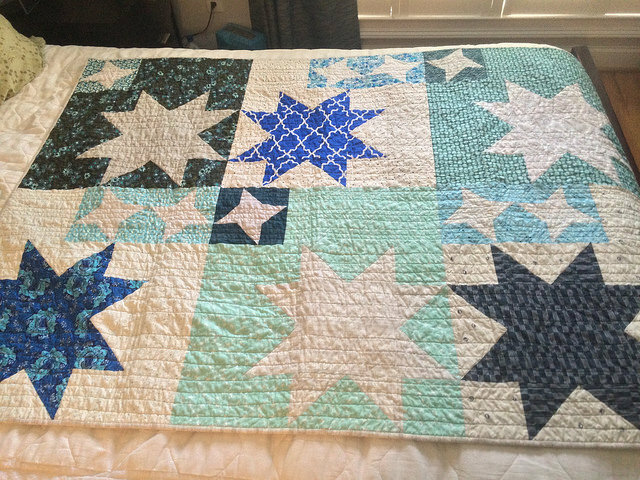 I know I've already improved by miles since I made this quilt in 2014. 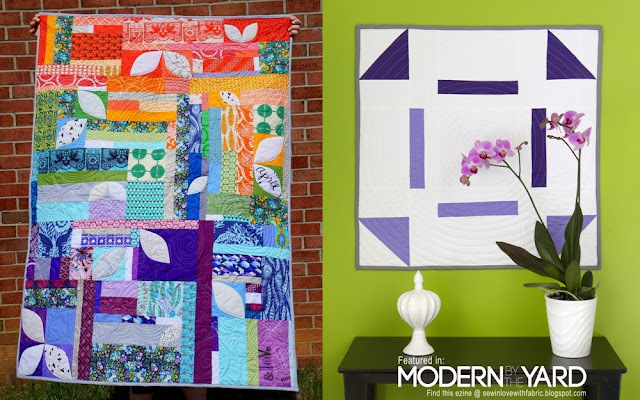 In other news, I've just learned that "Soar" and "Deconstructed Churn Dash" (two more recent makes) will be heading to the Modern Quilt exhibit at the Ontario Museum of History and Art in California this winter! 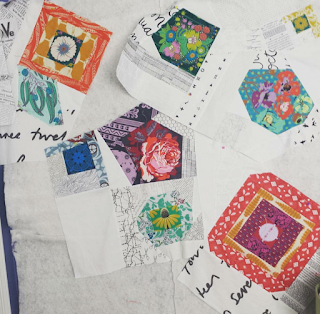 All the quilts are based on a modernized traditional block. 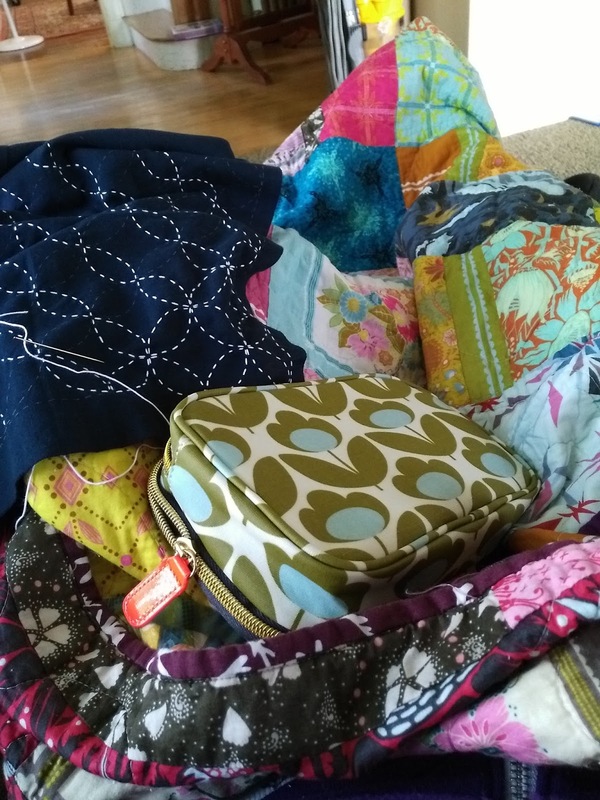 Now that three of my quilts will have traveled to California (further west than I've been), maybe I should go someday soon? 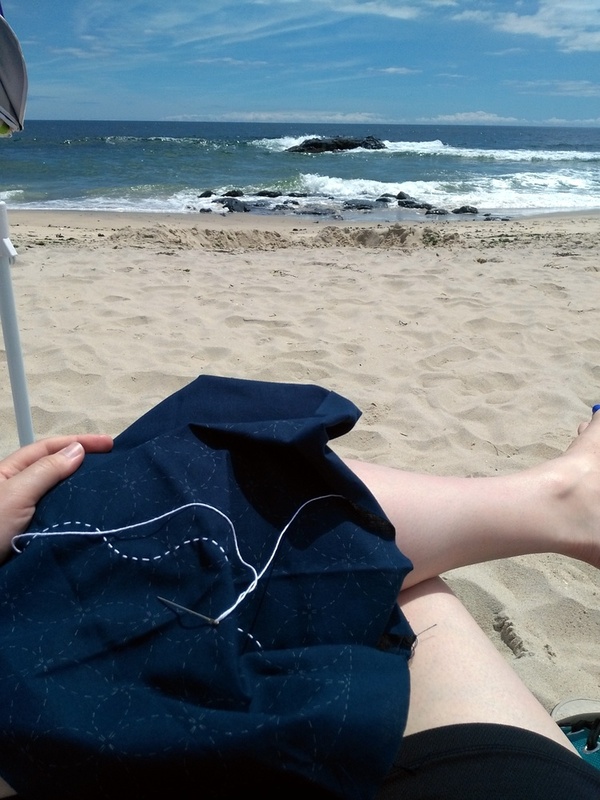 Also, lots of hand-sewing and Poldark are in my future (gotta get those quilt sleeves attached). Did you attend PNQE? 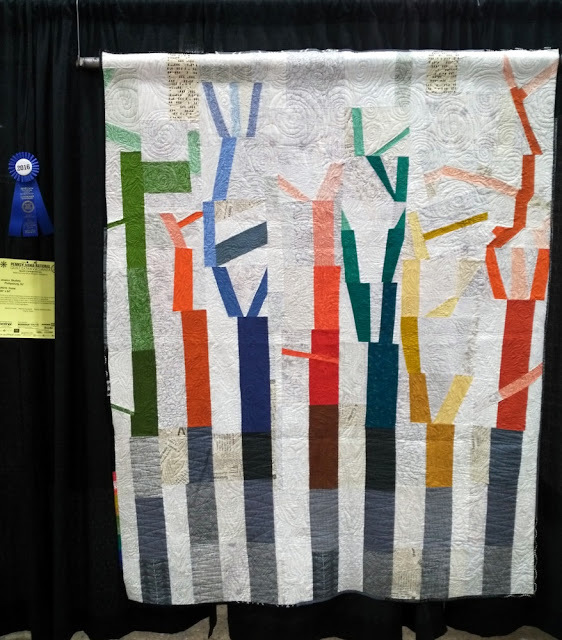 If not, what is your favorite quilt show you've ever attended? 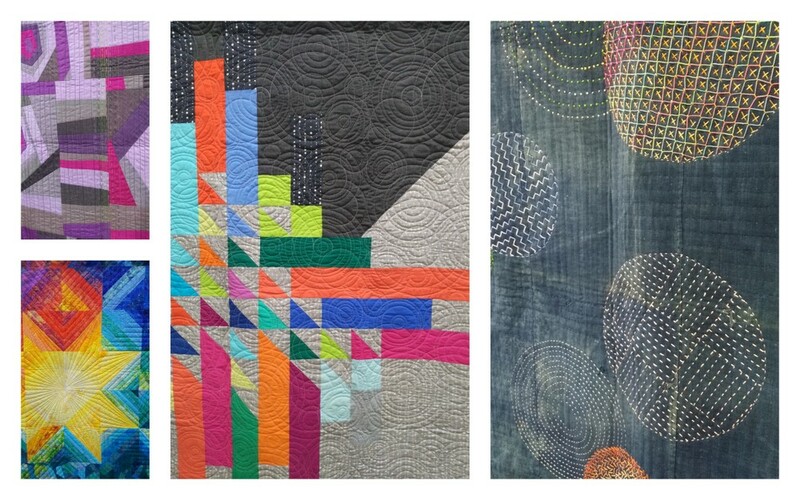 I'd have to say QuiltCon 2015 because of the sheer number of modern quilts in 1 room. Inquiring minds would like to know! 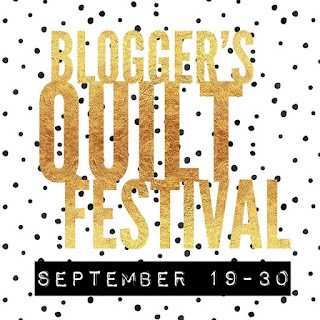 I've been participating in the Blogger's Quilt Festival for 6 years now. I can't believe that! There are less bloggers linking up than in the past, but it's always a great way to view tons of beautiful quilts all at once and never leave your computer or phone. 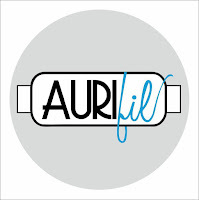 Thank you to Amy for spearheading such an important event in the quilting blogosphere! Today, I'm finally introducing my quilt, Trellis, which has quite a story and process behind her. She sits riiiight at the edge of the "Small Quilts" category, at 60" square. 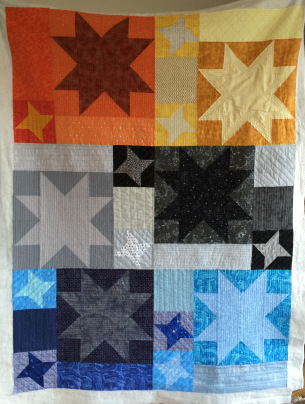 Similar to my other entry, Metropolis, this quilt was a long-term WIP that really challenged me to develop a myriad of sewing skills further. Apparently, I love a good challenge! My overall concept: the "trellis" that you might see in a garden, holding up flowers that have woven themselves over and through it, is actually invisible. Since that was the image in my head from the beginning, I thought it would serve as a good name. I envisioned a large pieced flower (top left) as the starting point, with all kinds of flowers and leaves growing off of it. 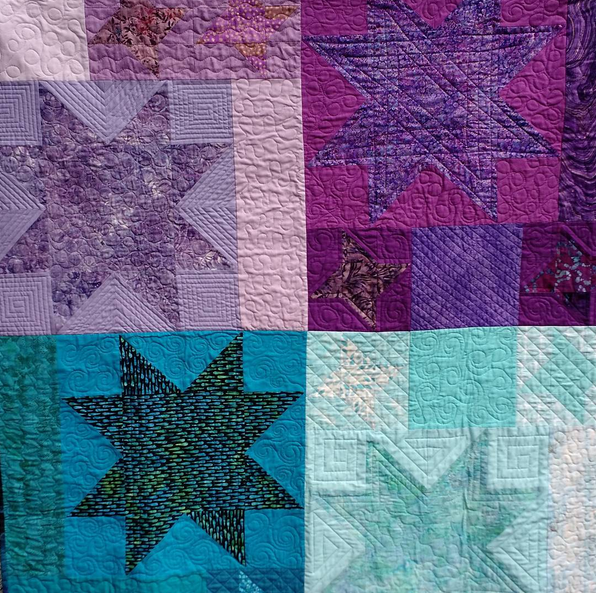 Eventually, I decided to add two black bars on either side of the quilt to suggest a garden gate. Hopefully, the flowers would flow over it! It's abstract but I like the depth it provides. I eventually ran out of steam while machine appliqueing flowers and the quilt became much larger than I originally imagined, but I'm very happy with the final look! 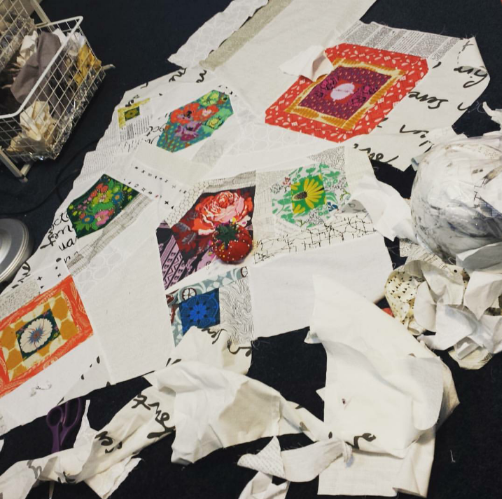 The piecing process was drawn out and interesting, to say the least. My design wall and floor were very handy. Here are some progress shots of lots of low volume, random curves, and partial seams. Just some of the flowers are appliqued; the background is completely pieced. Somehow it all came together over a year and a half; it was frustrating at times and I had to put it away often. I honestly didn't know if it would get finished this year... but it did! 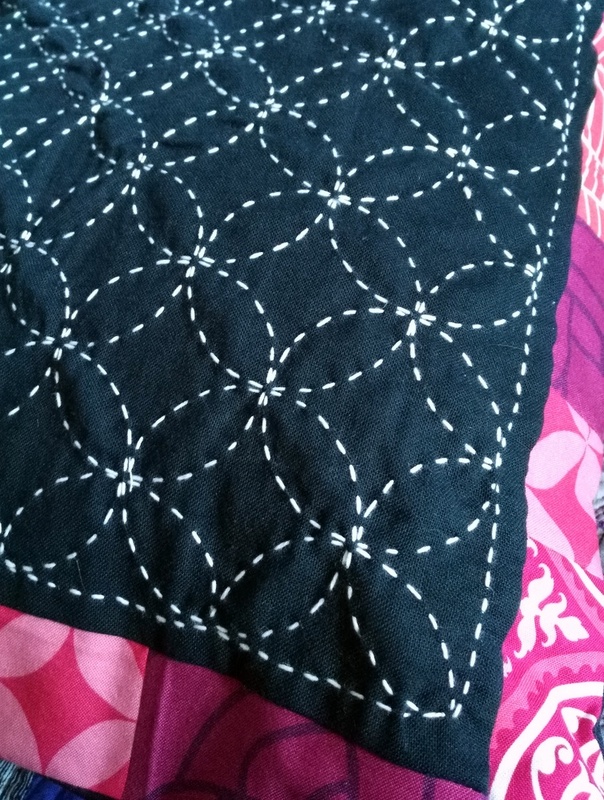 I made bias tape out of an old green AMH print, and it was perfect (see below)! I machine appliqued it all over the quilt, leading to different flowers and sections. That was probably the easiest part! 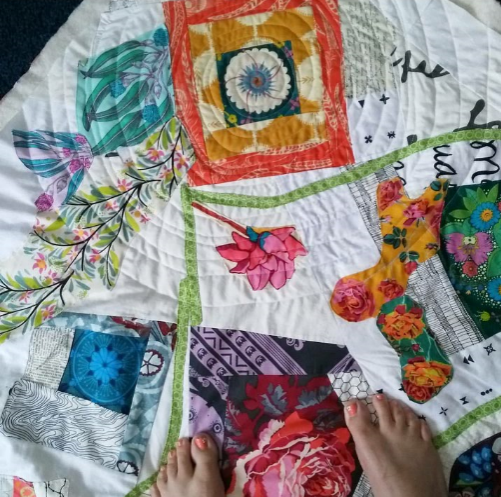 I used my walking foot to quilt an all-over spiral from the top left (where the trellis started) with Aurifil 2024 (white). 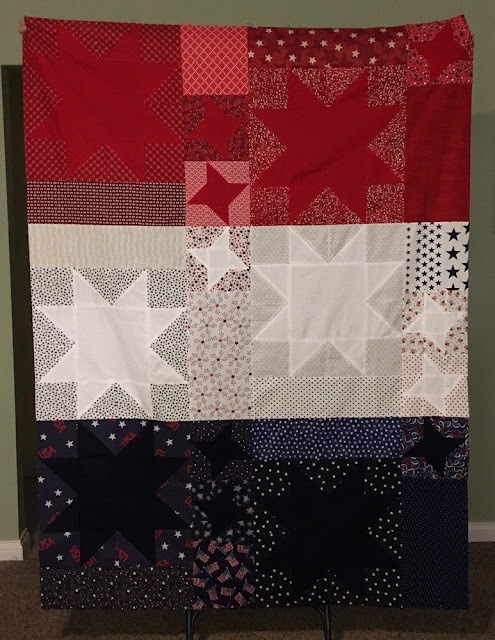 I felt like it was the only motif that could bring all of the elements of this busy, detailed quilt together, and the white blended perfectly. My favorite section of the quilt is the one below, where I appliqued two different colorways of the "Summer Totem" print from Loulouthi (my favorite fabric EVER in the history of the world). This part really conveys the "trellis" image. Plus, the Pride and Prejudice text print in the background (from Ardently Austen) is one of my favorite low volume/text prints! She's bound in low volume scraps for two major reasons: 1. To avoid detracting from the colors and gate bars and 2. 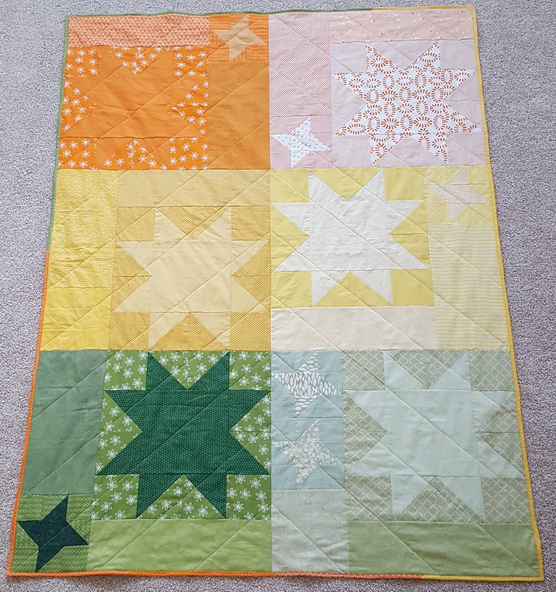 Because I had a ton of scraps! The backing is a conglomeration of many AMH prints I have hoarded and loved. 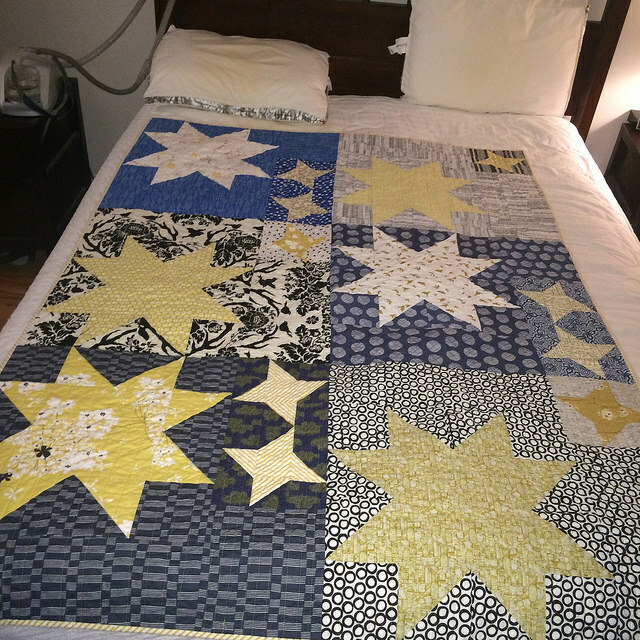 Since I'm keeping this quilt forever, I figured it was worth using up some large pieces (it was). 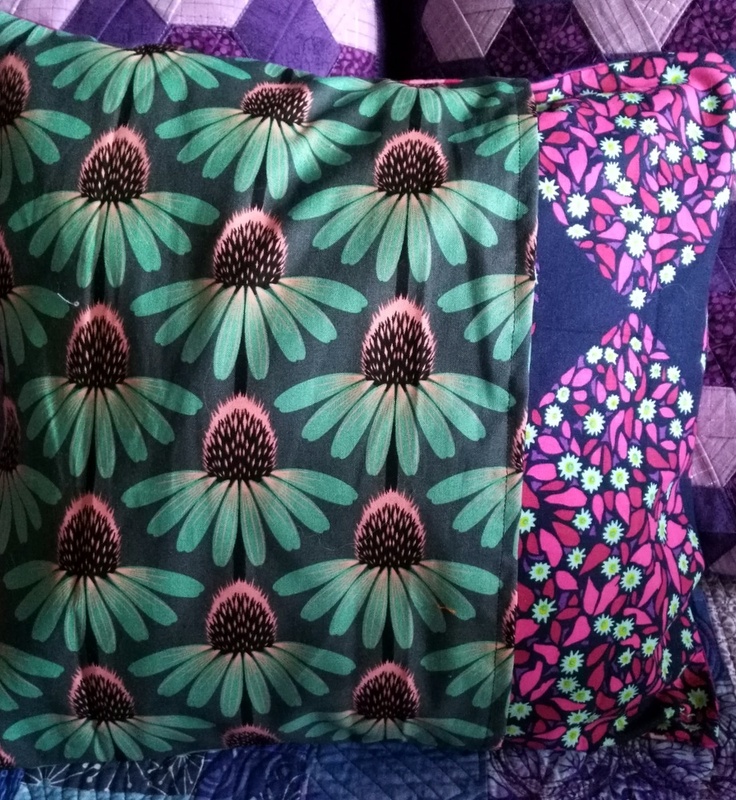 I'm particularly fond of "Summer Totem" (the large flowery piece on the left - I've always wanted to back something in that print thanks to inspiration from Ashley @wasntquiltinaday, who was in class with me!) and the book-like stacks! One last picture. I was going to hang it on my sewing room wall but it's way. too. big. I tend to "go big or go home!" Oh well - maybe next sewing room. After a lot of work in so many skill areas, I feel so thrilled and relieved to have completed this thing! 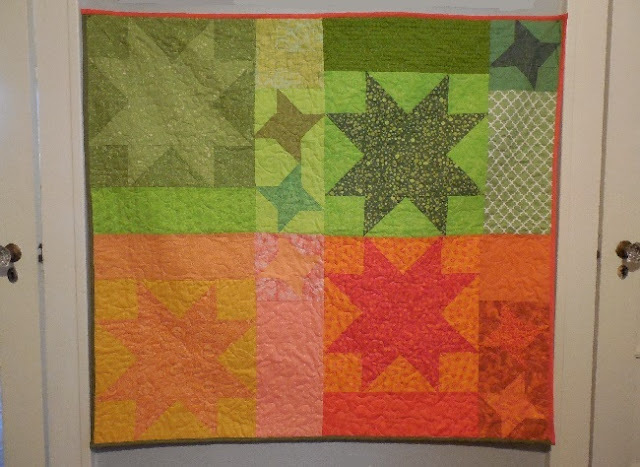 This is my second entry into this fall's Blogger's Quilt Festival. My first entry, Metropolis, is right here! 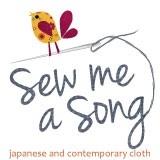 Please enjoy the festival, which has many categories of quilts. Make sure you vote for Viewer's Choice as well! Also linking up to Needle and Thread Thursday, Crazy Mom Quilts, Fabric Tuesday, TGIFF.